Hailsham is seeing some exciting changes which will improve the quality of life for those living and working in the local area. Hailsham Forward CIC are local businesses and Councils working together with the community to see a vibrant and successful town. Hailsham Town Centre, like many town centres, has seen much change in recent years. The town centre has a number of empty shops but the number is slowing falling and is below the National Average. Hailsham will continue to grow over the next 20 years. The Wealden Local Plan indicates the development of retail and employment space in Hailsham during this period. The Hailsham Forward Partnership was born out of the Mary Portas Vision for revitalising Town Centres. Hailsham Forward CIC is a Town Team Partner, is supported by Government, and the local councils and has received funding from Government, east Sussex County Council, Wealden District Council and Hailsham Town Council to undertake projects to improve the business community in Hailsham. The Partnership is made up of many local people and organisations including the Local Chamber of Commerce, Federation of Small Businesses, Local Councils, Hailsham Youth Council and Hailsham's MP. The Partnership is already working on a number of projects, as detailed in the projects page and had produced a business plan to help drive the revitalisation forward. 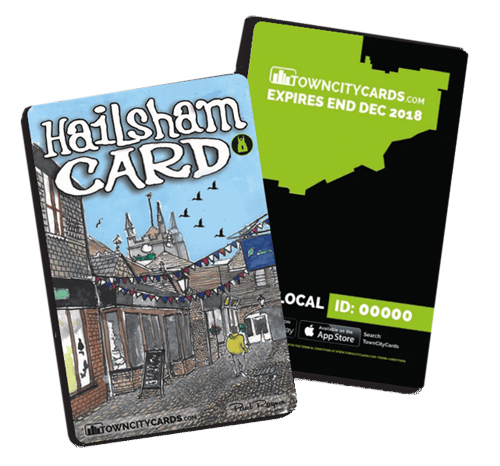 Please visit www.towncitycards.com/hailsham/ to find out where you can get some great offers in and around Hailsham.